Here you can find some of the most important things to read from the Clergy of the Joy of Satan Ministries. TO GET EDUCATED, INFORMED AND LEARN ON THE IMPORTANT ISSUES, CLICK HERE! The most important messages are selected and put into this forum with special attention. T.A.O.L. wrote: I know I probably won't get a reply on this but there is something I've been wondering about. They say from people whom are empathic or highly sensitive how they take on other peoples emotions and such as their own and the mainstream idea goes that one has to shield themselves from them or block the ability to do so. Now of course this is unnatural. But it is not entirely what I wanted to write/ask about. There have been times where I took on the rythm of other people and it seems I still do, but the clearest example I can think of is when I was in a dancing class and I had to partner up with someone. It was like despite it was not my rythm or speed, it was theirs, and for some reason I just went along and could keep up from the moment the music started. Now I am sure this has can be a good thing, but, on my own, I wonder, what would I be like if I was alone and didn't have these outside influences all the time? It seems quite easy to pick up on the less positive things around me, and my day just doesn't go like I want it to half of the time. I suspect it has to do with those that surround me, so I was wondering, how can I stick to myself, without being so influenced by other things from other people? I figured maybe someone here has a tip for me? I think this happens to people who have a strong influence of a mutable sign. The mutable signs are Sagittarius, Gemini, Virgo and Pisces. I know that feels uncomfortable. I've been there myself sometimes, too. Such as when ordering food with friends and end up agreeing with whatever they want to order, even though you would order something else. Just to cite a simple example. I think this naturally reverts as we strengthen our will. The will is naturally strengthened with power meditations, especially void meditation and meditations that stimulate and empower the solar chakra. But you could also take a moment to think of what things you enjoy the most yourself. What kind of things appeal to you to where you could enjoy doing them alone, independently of anyone's influence. What food you enjoy the most, what places you could go alone, etc. The more you do and cultivate these things, this self-enjoyment and such, with no outside influences, the more your personality will be strengthened. Hope I got your question right. The title attracted me, because to me this is exactly what Satanism is about - accepting yourself, instead of destroying your Ego! b) the connection to an alien force! This is the common denominator and the core of all of them. I don't want to offend anybody, but according to my view, the play with Chi, Prana, Kundalini etc. serves to eradicate the Ego. All Religions seem to be control-tools of Yaldabaoth/the Archons - except Satanism! But I'm still searching and learning, so I may be awfully wrong, but I'm very sceptic also whenitcomes to the far-eastern religons! Honing Void meditation so you can snap out of anything thought in the fraction of a second at any given time no matter what is happening. Thoughtcriminal wrote: The title attracted me, because to me this is exactly what Satanism is about - accepting yourself, instead of destroying your Ego! Those religions have been corrupted by the enemy, all of them were not like that before. The HP have talked about them a lot. For example we use many mantra's that come from the Hindu religion, just they way to use them have been corrupted and/or used in the wrong way but we have the right way to use them. So those religions have some parts that are good and some not, what you have to do is follow the teaching of JOS. 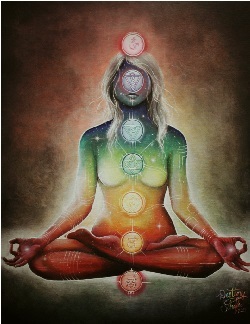 I'm still wondering, whether the Kundalini is friend or foe! After intense Qi Gong training and getting a hot spine I got sick and had health trouble for months! Until now I also never read a report from (of) someone who has risen the Kundalini successful and got BENEFITS from it, but, instead, there are many self-help articles out there dealing with how to "live with (the problems caused by) Kundalini" and "meditate on, it will get better (someday... in the future...). Do you see what I mean? I am experienced enough to know that the Kundalini energy is tremendous, but I still don't know if you 'sell (eradicate) your soul' to hostile forces by harnessing this power. In the Dao, Qi/Chi is said to have an intelligence - it knows where to go and what do do. Now, when I do the math, I come to: Energy + Intelligence = Entity! And Entities may have agendas with us, right? What agendas, I ask... Am I too sceptical? You're so programmed by xianity that your words are disgusting. So you try to harness a power like that and you just clash with it, suspect it for the worst and are filled with hangups. Then why exactly do you do this? In the same way if you see your heart as a foe for you mistreating it, same thing can happen with the Serpent. You clearly are mistreating and purposefully misunderstanding it. The people who are stupid and try to tamper with the Serpent do get punished. Some also die. There are xians and other people filled with hangups about spirituality and themselves tampering with it. They never reach it, but they are punished by the sulfuric flame. This is what happens when you have zero knowledge, zero respect, are filled with hangups and hate for our creator, and on top of it, want to just abuse this power. The serpent cannot peacefully exist in a mind filled with hangups, imbalances, beliefs that attack it etc. body organ and then blaming it for dying or something. http://www.josmarket.org/ Open - Full Orders Currently Closed Due To Time Constraints.